It didn’t dawn on me that there might be anxieties and risk involved in team learning until I put a few work teams at a Fortune 100 company under a microscope. To say the very least, what I observed was a wide-range of defensive and protective processes which ultimately closed off the team’s members from learning and instead created a variety of dysfunctions anchoring the team’s collective efforts in the harbor of mediocrity. As a result of this work I decided to take a closer look at how student-athletes learn in a team setting, and in particular how the context influences the perceived risk involved in learning to lead one’s teammates. Upon closer inspection it became obvious that many of the risks involved in team learning in the corporate world are mirrored in the athletic world. Likewise, learning to lead in a team environment is risky business. So, how do you get student-athletes to learn together? There are no simple answers. However, knowing that the context greatly affects learning is a step in the right direction if you’re serious about your athletes learning how to lead. When a student-athlete takes on a leadership role it’s important to understand that he or she will learn primarily through trial and error (which is why I firmly believe in deliberate practice—scrimmage—as a way to reduce perceived risks). If a student is learning physical geography he or she will learn in private with no one else aware of his or her mistakes. However, learning to lead in a team setting requires learning by trial and error in interpersonal interactions. Learning this way is certainly not learning in private and the consequences of actions always involve one’s teammates. Therefore, team leaders perceive risk in appearing ignorant and or incompetent in front of their peers. Because most student-athletes have little experience at leading, which includes making mistakes in front of teammates, such fears as embarrassment and rejection are always present. And many student-athletes are reluctant to take actions or to speak up or speak out for fear that their actions may be held against them by teammates. To neutralize such fears it’s in your best interest to create a psychologically safe environment. Let’s start with what I mean by psychological safety. It is a shared belief by all team members that the team is an environment where everyone has a sense of confidence that others will not embarrass, disrespect, disregard, or punish someone for taking action or speaking up or speaking out. All members understand that a supportive learning environment is necessary to build a psychologically safe team context. At the heart of the growth of a team leader is the leader as a learner, the learning process, and the context which together form the cornerstone of leadership development. Always keep in mind that the team leader is engaging in learning a new mind-set as well as a new skill-set. That is, the student-athlete as a team leader is undergoing a tremendous transformation and that is why creating a psychologically safe environment is necessary. The question, then, is what can you do to create a psychologically safe environment for team leaders learning to lead? The first step is to understand your team environment as it is and how it interacts with the internal achievement drive of your team leaders. To do this, use the model below. 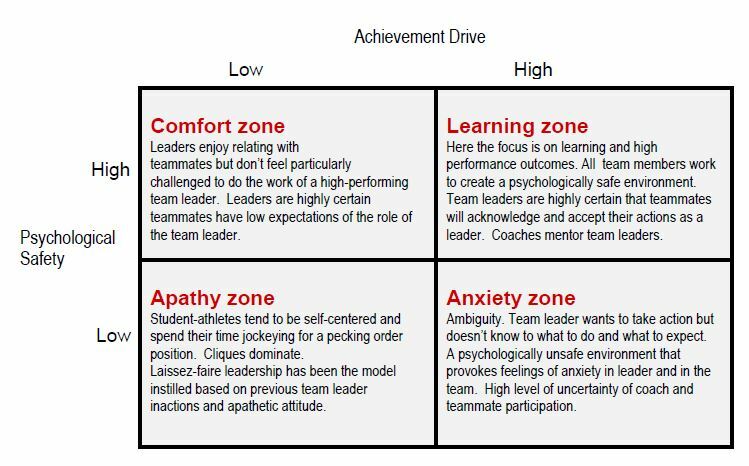 Hopefully the matrix above can provide a window into your current team context and how it is affecting the development of your team leaders. Psychological safety is an important component of creating an effective learning space for you and your team. The purpose of this brief article is to provide an introduction into the practice of developing a team leader’s capacity to lead through the process of team learning. When you involve all members of the team in the learning of leadership you’re more likely to create an effective learning environment. Let me issue a quick reminder that leadership is a social influence process in which team leaders work to motivate or persuade teammates to achieve specific individual and team goals. As such, the norms, beliefs, and values that emerge from team member interactions will create team dynamics that will influence the social structure and social processes that will either enhance or inhibit team learning. Your goal as the chief architect of the environment should be to create a psychologically safe learning zone. Ultimately, you have more to do with a team leader’s learning to lead—or not learning—than you probably thought you did. If you’re not growing team leaders, then it’s likely the problem is not the seed, it’s the soil.